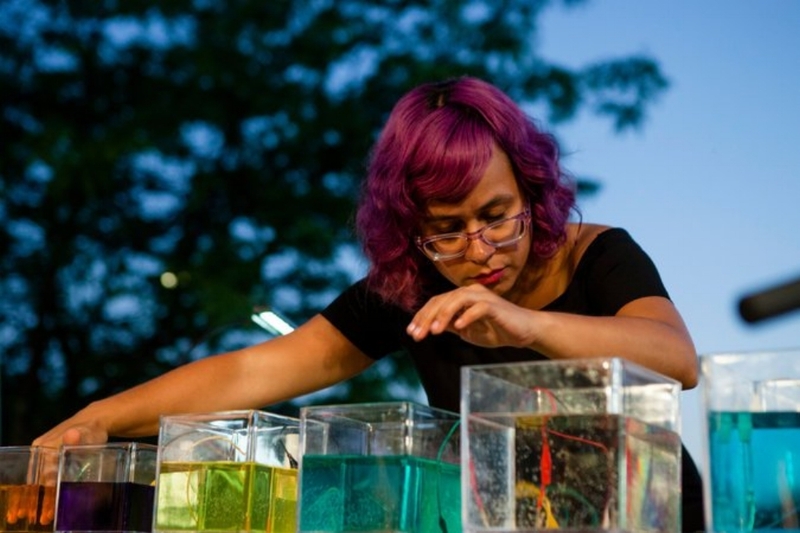 Angélica Negrón presents a collection of ambient pop songs for voice, live electronics, vegetable synth (via the Ototo interface) and mechanical instruments built by Nick Yulman. The performance will combine new songs which will be premiered at this event along with some of her recent work influenced by themes of escapism, delusion, longing and mortality. These songs explore the convergence between the organic and the artificial by combining acoustic found sounds and voice with automatic instruments that use robotic modules to play themselves. The vegetable synthesizer uses the Ototo interface to turn vegetables and fruits into a dynamic musical instrument that’s used for triggering samples of manipulated acoustic sounds. 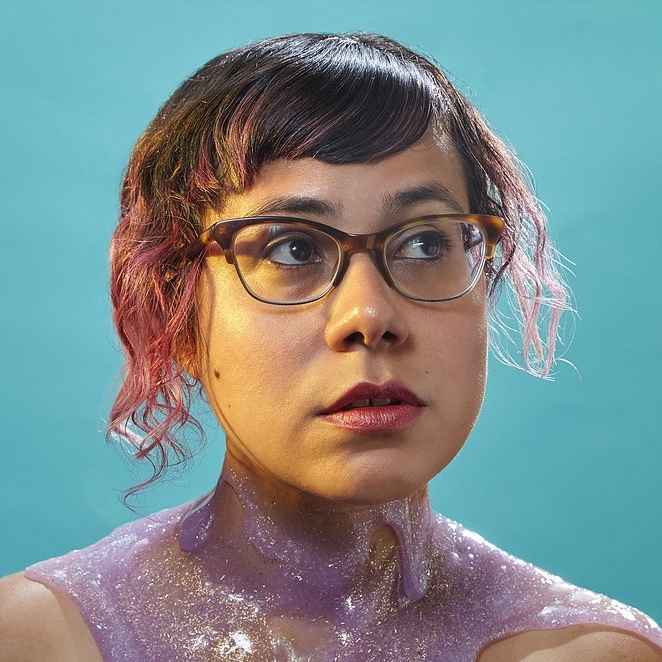 Through this unconventional domestic orchestra and her distinctive voice, Negrón seeks to highlight the sometimes-overlooked magic in the ostensibly insignificant, the mundane and the quotidian. A conversation between CUNY's Miguel Paz & Physicist Cristian Huepe. In 2012 Chilean physicist Cristián Huepe predicted the arrival of the post-truth era by using mathematic modeling to see how disinformation flows in online networks. As part of an academic research project, Huepe demonstrated that when networks are made of core groups of people with similar opinions connected with few sources of information there is a tendency to reinforce beliefs over facts and reduce the number of information sources you consume to only those that tell you things you agree with. In this talk journalist Miguel Paz and Cristián Huepe will explore this topic, how Huepe came to this conclusion and how filter bubbles and fake news develop. They will also engage in a Q&A abut how this phenomenon connects to multiple other factors ranging from economics, design, the crisis of credibility in public institutions and the media industry. Framed as a joint presentation-interview, the session will include time for an open conversation with attendants. Dr. Cristian Huepe is a theoretical physicist and an electronic musician. As a scientist, he leads his own CHuepe Labs Inc. and is one of a handful of unaffiliated researchers that has been funded by the US National Science Foundation. He conducts research in complex systems, nonlinear dynamics and statistical physics, working in various areas throughout his career. His current research focuses on the dynamics of collective motion, complex networks, multi-scale evolution, and the emergence of post-truth in opinion dynamics. As a musician, he has produced and released several albums for over two decades and has performed in Europe, North and South America, and Asia, both as a solo artist and as a member of the Makers of Sense duo. Huepe also develops projects at the art/science boundary, studying and developing music as a complex system. Dr. Huepe obtained his PhD in Physics at the École Normale Supérieure in Paris, after completing undergraduate studies in his native Chile. He then worked as a postdoc in Chicago, first at the University of Chicago and later at Northwestern University. Since 2006, Dr. Huepe has worked as an unaffiliated scientist and head of CHuepe Labs Inc., supported by research grants and developing collaborative projects around the world. His work has been featured in Science Daily, Focus Online, National Geographic Germany and Wired Magazine, among others. His recent work describing the dynamics of post-truth has received widespread attention from the press, especially in his native Chile, where several articles describing his research have been published. Miguel Paz is a distinguished lecturer in Data Journalism at the Graduate School of Journalism of the City University of New York (CUNY). 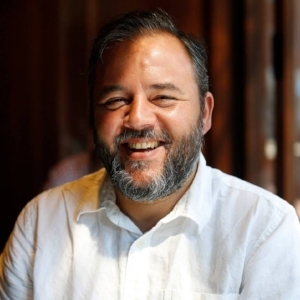 A native of Chile, Paz is known for his work as an investigative journalist and digital media strategist. He is the founder of Poderopedia, a data journalism website created in 2012 to keep track of who’s who in business and politics in Chile, Colombia and Venezuela. Paz is a Nieman Berkman Fellow ´15 at Harvard, a Knight ICFJ Fellow 13´and is part of the board of Global Voices. He has 18 years of experience as a reporter and editor in Latin America. His work appears in three books published in Chile and has been awarded two times in the chilean Journalism Award for Excellence. RockNLolo is 45 minutes long full of singing and dancing, while learning Spanish, and most importantly, having fun! Intended for toddlers up to 4 years old, each RockNLolo's song it was created to make feel kids engaged during the whole learning process. and to create asociation between words and understanding concepts because of context. RockNLolo's program helps to build childs conﬁdense, self-control, and early Spanish language skills through repetitions and original engaging melodies. Laura Dayan, founder of RockNLolo, felt a commitment as an artist to challenge herself and challenge the little ones as well, non giving for granted that those little monsters, have a huge facility to learn and absorb it all. "Lolo" believes that people communicate better when there is respect and love, that's why she decided to add a simple but super important condiment to her classes. She wanted to give the most powerful told for their future to connect and be able to express themselves not only in a new language but also with values and good manners. That's the real RockNLolo's Goal. To entertain but also educate our kids, for a hopefully near future better world. Respect and love, is possible when people communicate. The Touch Ensemble: Jamming together on touchscreens. Join us on our collaborative music-making station where iPads and iPhones are loaded with the award-winning app Auxy and running in sync to create an ever-evolving improvised composition. Hop in and out at any point by choosing from a variety of roles: percussion, bass, lead, chords, effects and more. No musical experience required. All ages welcome! Mateo Zlatar is a designer and composer working on the crossroads of art and technology. In 2001 he moved to New York to pursue his life-long passion for sound design, and human-computer interaction. In 2003 graduated with honors from Parsons with an interactive sound installation titled “Aural Limbo” that converted public spaces in “inhabitable sound scores” that the passersby could experience and engage with by playing music with their physical presence and movement. Mateo has published two albums and a few EPs under the OffCmd moniker. La Liga Zine Fest at Starr Bar, New York. This year, we are putting together a publications fair, working as well with Sangría Editora and La Liga Zine to showcase Latinx and Latin American creators working in the U.S. Brooklyn Bazaar's classic Banquet Hall will host the fair, making it the point of entry to the New Latin Wave festival 2017.